The Lord said to His disciples: If any man will come after Me, let him deny himself, and take up his cross, and follow Me (Matt. 16:24). What does “his cross” mean? Why is this cross – his own, i.e. the separate and individual cross of each person, – also called the Cross of Christ? One’s own cross: the sorrows and suffering of earthly life, which are individual to each person. One’s own cross: fasting, vigil, and other pious spiritual labors through which the flesh is humbled and subjugated to the spirit. These labors should be appropriate to each person’s strength, and they are individual to each person. One’s own cross: illnesses and passions, which are individual to each person. With some of them we are born, with others we become contaminated along the path of life. The Cross of Christ is represented by Christ’s teaching. One’s own cross, no matter how heavy, is fruitless and in vain if it is not transformed into the Cross of Christ by following Christ. For Christ’s disciple his own cross becomes the Cross of Christ, because Christ’s disciple is firmly convinced that Christ watches over him ceaselessly, that Christ allots him the sorrows as a necessary and inevitable condition of Christianity, that not a single sorrow could come near him were it not allowed by Christ, that through sorrows a Christian becomes united with Christ, becomes a participant in His lot on earth and, therefore, in heaven. For Christ’s disciple his own cross becomes the Cross of Christ when Christ’s disciple regards the fulfillment of Christ’s commandments as his sole purpose in life. These most holy commandments become for him a cross on which he ceaselessly crucifies the flesh with its passions and lusts (Gal 5:24). Thus it is obvious why, in order to take on one’s cross, one must first deny oneself. This is because sin has become such a strong and widespread part of our fallen nature. Thus, in order to take one’s cross upon one’s shoulders, it is first necessary to deny the body its lustful desires and provide it only with what is essential for existence; it is necessary to regard one’s own self-justification as a lie before God and one’s own reason as foolishness; and finally, by engaging in a continuous study of the Gospel, it is necessary to fully reject one’s own will. Only a person who has achieved such complete self-denial is capable of taking on his own cross. With obedience to God, calling upon God’s help to strengthen his frailty, such a person looks upon approaching sorrow without fear or agitation, is prepared to suffer it magnanimously and courageously, hoping that it will make him a participant in Christ’s suffering, and will confess Christ not only with his mind and heart, but also with his very deeds, his very life. A cross is burdensome only while it remains one’s own. As soon as it is transformed into the Cross of Christ, it attains incredible lightness: for My yoke is easy and My burden is light, said the Lord. The cross is placed upon the shoulders of Christ’s disciple when the disciple acknowledges himself to have merited the sorrows sent to Him by Divine Providence. Christ’s disciple carries his cross properly when he acknowledges that it is precisely the sorrows that have been sent him, and none other, that are necessary to his salvation. The patient bearing of one’s cross is the fruit of genuine vision and recognition of one’s sins. The patient bearing of one’s cross is genuine repentance. By accusing our own selves we justify God’s judgment and receive remission of our sins. O thou who art crucified on the cross! Acknowledge Christ – and the doors of Paradise will open for thee. From thy cross glorify the Lord, rejecting all thought of complaint or grumbling. 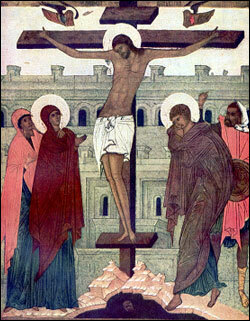 From thy cross thank the Lord for such a precious gift – the opportunity to be one with Christ through thy sufferings. The cross is a true treasure-chest of genuine theology. Outside the cross there is no living knowledge of Christ. Do not seek Christian perfection in human virtues. It is not there: it is hidden within the Cross of Christ. One’s own cross is transformed into the Cross of Christ when Christ’s disciple bears it with a lively realization of his sinfulness, when he bears it with gratitude towards Christ, with laudation of Christ. The laudation and gratitude engender the feeling of indescribable spiritual joy within the sufferer, which encompasses his heart with grace, pours out upon his soul, pours out upon his very body. The Cross of Christ seems severe only in outward appearance, only to mortal eyes. For Christ’s disciple it is a supreme spiritual pleasure which completely drowns out sorrow, so that among the most terrible anguish Christ’s follower feels only pleasure. Saint Maura said to her husband, Saint Timothy, who was suffering terrible torments and inviting her to take part in the martyrdom: “I dread, brother, to succumb to fear, seeing the terrible torments and the wrathful ruler, and to lose endurance because of my tender age.” The holy martyr replied to her: “Have hope in our Lord Jesus Christ, and your torments will be as fragrant oil poured upon your body, and as the breath of dew within your bones, easing all your suffering” (Lives of the Saints, May 8). The cross is the power and the glory of all the saints. The cross is the healer of passions and the destroyer of demons. The cross is deadly for those who did not transform their own cross into the Cross of Christ, who grumble from their cross at Divine Providence, blaspheme against it, give themselves over to hopelessness and despair. Unrepentant sinners die an eternal death, by their lack of patience depriving themselves of true life in God.